In 2015 world leaders meeting in Paris agreed to move towards zero net greenhouse-gas emissions in the second half of this century. That is a tall order, and the building industry makes it even taller. Cement-making alone produces 6% of the world’s carbon emissions. Steel, half of which goes into buildings, accounts for another 8%. If you factor in all of the energy that goes into lighting, heating and cooling homes and offices, the world’s buildings start to look like a giant environmental problem. Wind turbines and solar panels on top of buildings look good but are much less productive than wind and solar farms. And the standards only count the emissions from running a building, not those belched out when it was made. Those are thought to account for between 30% and 60% of the total over a structure’s lifetime. Buildings can become greener. They can use more recycled steel and can be prefabricated in off-site factories, greatly reducing lorry journeys. But no other building material has environmental credentials as exciting and overlooked as wood. The energy required to produce a laminated wooden beam is one-sixth of that required for a steel one of comparable strength. As trees take carbon out of the atmosphere when growing, wooden buildings contribute to negative emissions by storing the stuff. When a mature tree is cut down, a new one can be planted to replace it, capturing more carbon. After buildings are demolished, old beams and panels are easy to recycle into new structures. 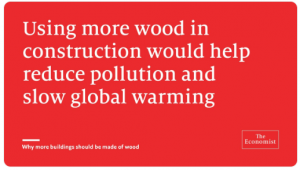 And for retrofitting older buildings to be more energy efficient, wood is a good insulator. A softwood window frame provides nearly 400 times as much insulation as a plain steel one of the same thickness and over a thousand times as much as an aluminium equivalent.